Prior to owning my MacBook Pro 13, I had always subscribed to the belief that Macs were significantly more expensive than other computer brands (Dell, HP, etc.). So, in 2009 when my Sony Vaio was no longer cutting the mustard, I started shopping for a new laptop and I found the (expensive) stigma that Macs had wasn't really true. 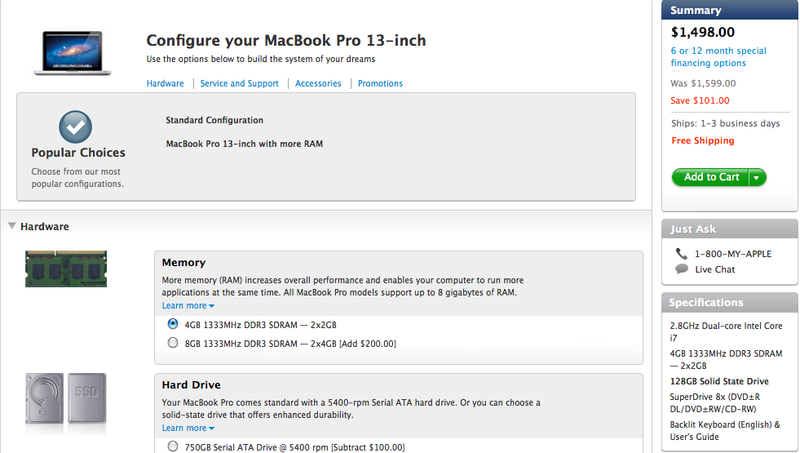 At the time I took the MacBook Pro 13 feature for feature with a comparable Dell laptop. And it turned out that the Dell was actually $50.00 more expensive than the MacBook Pro 13 that I had chosen. So, now I am curious if the same holds true today. 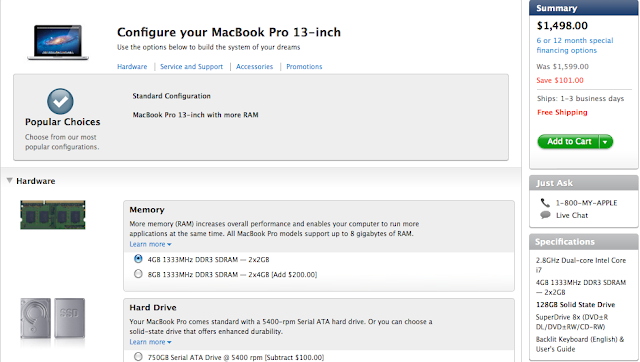 Looking online in the Apple store, I can see that the 2nd MacBook Pro 13 model is $1398.00. It comes with a 13.3" high-res LED monitor, a backlit keyboard, Bluetooth, wireless a/b/g/n, 720p webcam, 2.8Ghz dual core i7 processor, 4GB of RAM, an 8x slot loading superdrive, and a 750GB internal hard drive. Not bad for a 13.3" laptop. 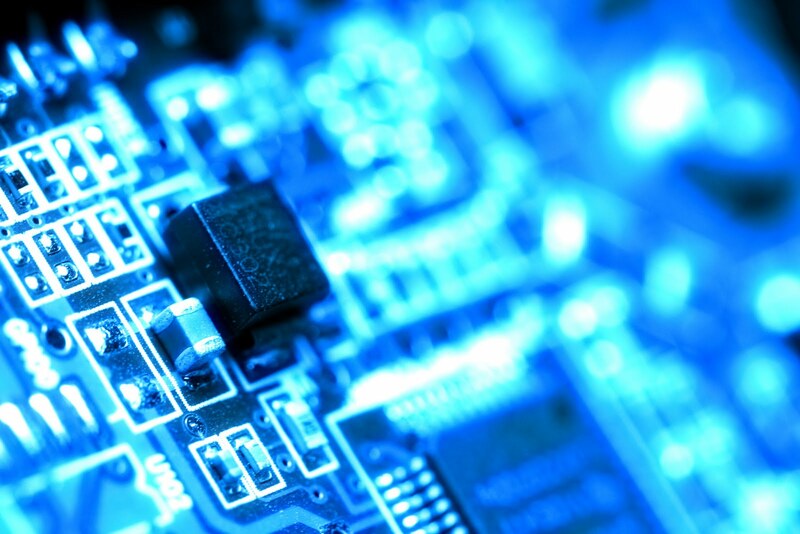 At the Dell store online there are a plethora of options. So, I select the laptop link and begin entering my search requirements: 4GB RAM, i7 processor, 13.3" screen, and 64-bit OS. The Dell Latitude E6320 pops up and I select customize. I change the selected Windows 7 64-bit Home to Windows 64-bit Ultimate for an even comparison with the MacBook's included OS X Lion which is 64-bit. The difference between Home and Ultimate is that Ultimate comes with additional video editing & playback capabilities, Media Center, additional enterprise management controls, enhanced window features, and a few other things. Basically, Windows 7 64-bit Ultimate gives you a real enterprise Windows system, where Windows Home gives you what I would consider to be the bare minimum. In comparison with OS X Lion, there is only one version. And it gives you a real enterprise system with optional development tools (for free), not to mention photo management software, music editing software, video editing software, a calendar, email and an address book with Exchange support. Continuing with my customizations of the Dell, I noticed there was no 750GB drive option, so I decided to change both the MacBook Pro 13 and the Dell E6320 to have a 128GB SSD (Solid State Drive). I then selected the 8x DVD+/-RW drive, the 6-cell battery (to give it somewhat comparable battery life to the MacBook Pro), the Advanced-N a/b/g/n wireless card, Bluetooth, and the 2.7Ghz i7 processor. At this point, it seems like my MacBook Pro 13 and my Dell E6320 configurations are pretty comparable, minus some intangibles and personal preferences (weight, thickness, fans/heat dissipation, backlit keyboard, 0.1Ghz clock speed difference, trackpad prefs, etc.). And the verdict? 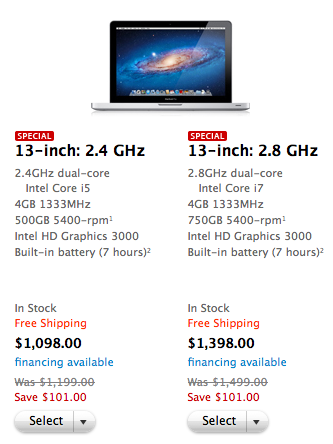 The MacBook Pro 13 came out to be $1,498.00 and the Dell came out to be $1,707.00. If you are a bargain hunter then this won't matter because if price is your main driver then you will opt to have less features for a lower price. 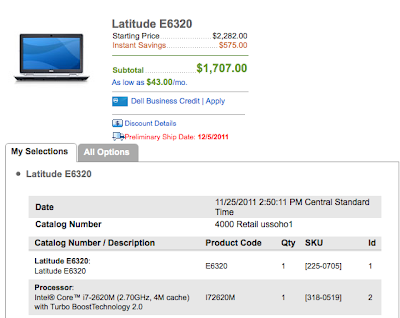 And in that case, there are Dell's out there that have less features for significantly lower prices. However, if you are like me and you want a well equipped machine that you expect to last for several years and if you are considering a MacBook Pro then it's hard (even for Dell) to beat it on price when you go feature for feature.